Encouraged by his client villagers, Ohannes Baghdassarian established Cremerie Karoun in 1931, named later Laiterie Karoun. Initially a small-scale manual operation, Karoun dairy steadily improved its production methods by applying up to date science & technology. After world war two KAROUN invented a new process to produce hygienically and industrially the very popular product in the Middle East: yogurt drink. This production method is still in use till now. This made KAROUN the preeminent brand for drinking yogurt. 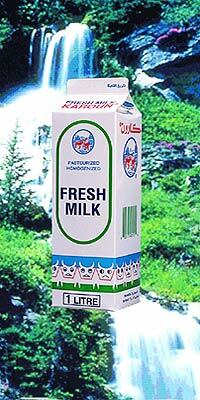 In 1952, KAROUN DAIRY introduced pasteurization and began to home deliver fresh pasteurized milk in glass bottles in addition to distributing its other products - yogurt, laban, labne, drinking yogurt, whip cream, cheeses and butter, to hotels and restaurants in Beirut, and some retail stores in its neighborhood. KAROUN owned also its own retail store in the central district of Beirut specialized in its own products and some other related products. In 1963 the distribution system was entirely reorganized to cover the totality of Lebanon: its fleet of delivery vans distributed KAROUN dairy products exclusively to retailers, hotels and restaurants. In 1968 KAROUN Dairy was the first to introduce in Lebanon the one-way plastic containers replacing the returnable glass bottles of fresh milk and drinking yogurt. It was also a pioneer in introducing the round plastic cups replacing the jars of clay of yogurt. The same year KAROUN DAIRY began to market for the first time in Lebanon yogurt with real fruits under the brand "Yofruit". In 1971, Ara Baghdassarian the owner's son took over marketing and administration. As demand for KAROUN'S products continued to exceed output despite several increases in capacity, it was decided to undertake yet another expansion: to transform the firm into a corporation and erect a new plant. 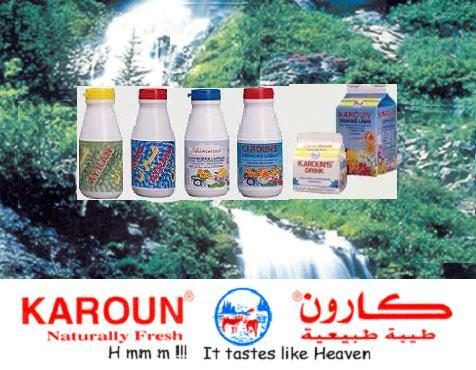 In 1972, Ara Baghdassarian initiated and incorporated KAROUN DAIRIES SAL. Following his father's wishes, Ara kept the company family owned and operated. In December 1973, a state of the art new plant took over from the old facility. In 2007, KAROUN DAIRIES INC. Middle East cheese dairy products company, registered in New Brunswick, began operations, supplying all natural artisan cheeses to retailers in Canada. In 2008, KAROUN DAIRIES SAL licensed to KARLACTI, Inc., a USA corporation, its logo, trade dress, processes and formulae. KARLACTI, Inc. is the exclusive licensee of KAROUN DAIRIES in the USA.